Muhammad Farhan Akhtar, an Australia Awards alumnus from Lahore, Pakistan, wants to achieve effective public policy changes in his home country, and create better lives for the poor through inclusive growth via private sector. Farhan completed his Master of Public Policy at the Australian National University (ANU) in 2016, through an Australia Awards Scholarship, and was awarded the Master of Public Policy Prize for maintaining the best aggregate score amongst his peers throughout the program. He now works on the Australian Government’s flagship private sector development program, Market Development Facility (MDF) in Pakistan. As part of the work he carries out as the program’s Quality and Inclusion Specialist, Farhan conducts impact assessments to determine the pro-poor impact of MDF’s interventions with the private sector in Pakistan. This impact is measured by additional employment and income generated, including how these influence individual wellbeing and facilitate change for women’s economic empowerment in each of the sectors MDF works in. Farhan then started his Master of Public Policy at the Australian National University (ANU) through an Australia Awards Scholarship. ‘My first impression about Canberra was ‘quiet and green’. The first thing that I noticed at ANU was the cultural diversity that local and international students bring to the campuses and communities,’ he says. Farhan had a rewarding experience in Australia. He was elected as the President of Crawford School Students’ Society (CSSS) and had the opportunity to work with ANU thought leaders through the Vice Chancellors’ Student Leadership Program. In addition to his Master’s degree, Farhan also completed the requirements for a Graduate Diploma in Public Administration. According to the Dean at ANU’s College of Asia and the Pacific, Farhan achieved the best overall aggregate results, thus granting him the Raymond Anthrope Graduate Diploma Prize, 2015. In July 2016, Farhan was selected to deliver the outgoing scholar address at the mid-year Welcome & Farewell Australia Awards event in Canberra. 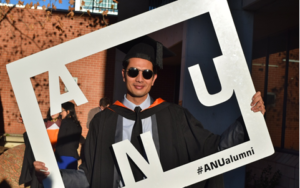 Farhan is also facilitating a collaboration between a local university in Lahore, Pakistan with various Australian universities including ANU. The aim of this initiative is to facilitate capacity building of teachers at the local university through an exchange program hosted by Australian Universities.